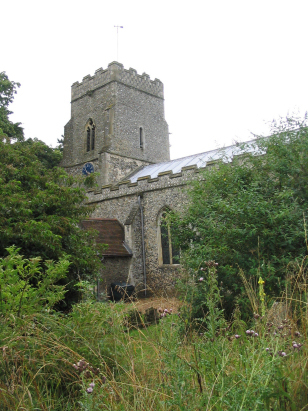 The parish of Starston is located in southern Norfolk about 2 miles northwest of the market town of Harleston and 7 miles northeast of the market town of Diss. Starston lies on the broad lane which links Harleston through the Pulhams to the busy A140 Norwich to Ipswich road. It lies just as you climb out of the valley of the River Waveney, which forms the border with Suffolk. Starston is an agricultural community and perhaps has always been thus. The landuse is dominated by arable farming notably of grains but also of beet and oil seed. Starston sits in a shallow valley, a brook heads eastwards to join the Waveney at Wortwell, but the land all around rises to form a fairly level plateau which stretches northwards towards Long Stratton & Hempnall. Starston was quite densely populated at the time of this transcript but nowadays probably has a smaller population, most of it grouped around the main crossroads of the village. St Margaret's church sits just north of that main crossroads, on the eastern side of Hardwick Lane. As can be seen it is rather enthusiastically given over to wildlife making a grave search tricky in the summertime. Pevsner dates much of the structure to the 15th century but rather dismisses the church architecturally in half a dozen lines. He devotes more space to its internal wall paintings than to the external structure. 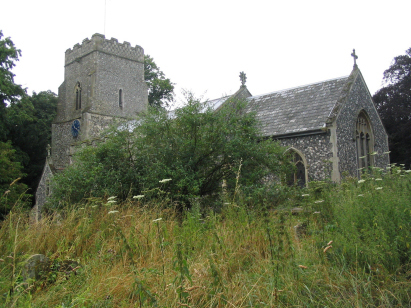 The church is in a slightly elevated site, surrounded by a typical Norfolk flint wall. Two standard 800-entry register books cover the period of the transcript although this is difficult to spot as the second in not prenumbered and the clerk continues the numbering from the first book. The first book runs to 1876, the second continues until the late 20th century. Both registers are filmed on Microfilm MF1405 in the collection of Norfolk Record Office which was used to prepare this transcript. The film is a modern one and benefits from the higher standards achieved recently. This is needed as at times the handwriting is scruffy and the entries for a handful are tricky to read. Hopefully few errors will have been made in reading those entries.